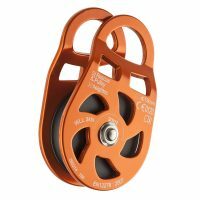 Lightweight, compact fixed cheek pulley for general or personal use. The 5 cm aluminium rescue pulley is an Aluminium, single sheave, rescue pulley. Features anodised aluminium side plates with nylon pulley wheel for reduced weight. 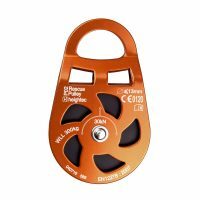 The aluminium rescue pulley also features wide opening swivelling plates for easy attachment to rope. There is room for multiple connectors in large attachment point. The large diameter sheave increases mechanical efficiency. For rope 13 mm diameter or smaller. 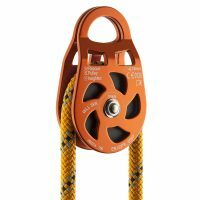 View heightec’s full range of pulleys including the TORNADO lifting and lowering device for controlled lifting and lowering, CYCLONE heavy duty hauling pulley with a locking cam and HURRICANE rope grab with pulley – casualty recovery hauling device. 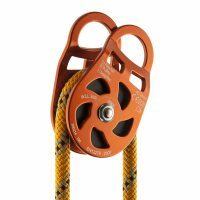 Rope diameter 13mm or smaller.